My grandpa has always been a hero. During the tumultuous years of WWII, he served in the navy and captained a patrol boat in the Pacific. Following the war, he resumed his stellar track career and competed in the 1948 Olympic Games in London. During his forty years as head track coach at Brigham Young University, he coached 26 Olympians and 118 All-Americans, earning him a place in the U.S. Track Coaches Hall of Fame. I have always loved and revered my “Pappy”. One of Pappy’s former track athletes, a pole-vaulter named Dave, runs a fishing lodge in Gustavus, Alaska. Each year, he invited my grandpa up to stay in the lodge and fish in the pristine waters of Glacier Bay National Park at a substantially discounted price. I’d always dreamed of the chance to join Pappy on one of these trips, but because money was tight, I had to settle for the pictures and stories Pappy brought back from these annual treks. One day I received an unexpected phone call from Dave. He introduced himself and explained that because my grandpa’s health had been failing a bit of late, he felt it would be important for me and my dad to join Pappy on this particular trip. Dave must have known that my teacher’s salary would make it difficult to afford, because he generously offered us the same discount he always gave Pappy. And so here we were, flying in a single-engine plane from Juneau to the tiny airport in Gustavus. The next morning, we set out into the magnificent Glacier Bay. Humpback whales surfaced and jumped all around us as we patiently waited for the halibut bite. We only caught a few that day, and none were over twenty pounds. Yet, I couldn’t complain. I’d just spent an amazing day with my dad and grandpa, surrounded by humpback whales and sea otters. a deep, commanding voice. It was a wonderful conclusion to an awe-inspiring day. The next day was our final day of fishing and we decided to hike into a nearby river to fish for silvers, then finish up with some halibut fishing in the bay. The silvers were giant and plentiful, and we limited out in less than an hour. But it was bittersweet—because of his physical condition, Pappy had been unable to hike up the river with us, and had to wait in the boat. When we returned to the boat and headed out together into the bay, I was excited to spend this one final day fishing with him. And what a day it was—the sun was shining and the humpback whales were surfacing all around us. The fishing was just starting to pick up when my dad let out a holler! His pole doubled over and I swear the boat rocked. My dad is a former NFL lineman, so to see him straining that hard made it clear this fish was definitely a monster. The battle was intense and lasted about an hour. 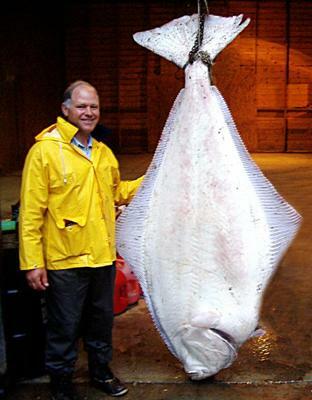 Because firearms are prohibited in the bay, the captain harpooned the halibut when we got it close. 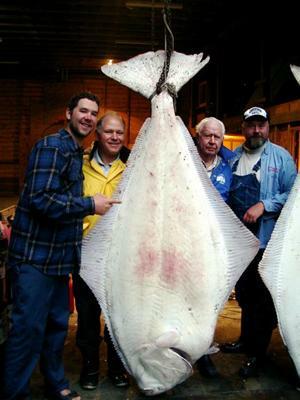 We all pulled together and somehow managed to get my dad’s 395-pound halibut into the boat! When we reached the dock, a crowd gathered to gawk at the behemoth. Pappy stood right next to my dad the whole time and looked like a kid on Christmas morning. 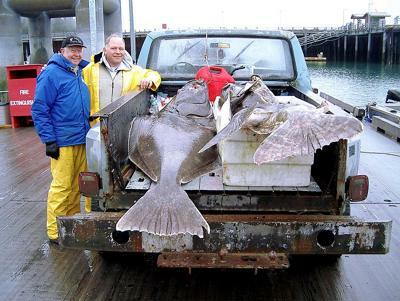 I snapped a photo of them after we had loaded it into the back of the lodge’s pick-up truck, along with the other massive halibut we caught that day. This picture is now one of my most treasured possessions. It was an amazing end to the special trip we’d been able to share with Pappy. About two weeks after we returned home, Pappy died peacefully in his sleep. It was a terrible blow, but I was comforted by the memories of our special trip. I’ll definitely never forget those sacred days I spent in Alaska with my hero. I thought this is supposed to be a freshwater fishing contest. Oh well, the more submissions to the contest, the better... right? I mean to get enough to entries to be able to qualify for the money prizes. BTW, AWESOME Halibut!!! I love it. How did it taste? It had to be good huh? Wow! I just seen this photo in a June/July 2009 issue of a magazine that my neighbor had. (I won't say which one.) I knew I seen this picture somewhere else, so I searched around a little and here it is. It shows that it won a photo contest for a category called "Hero Shot, Fishing". And that you guys caught about a dozen halibut that day. That's amazing! Nice job fellas!